On unrelated notes, Happy Birthday PKMNMasterClara's dad... I lost my grandad to prostate cancer last winter on my childhood friend's birthday so I think I might know what it feels like. On more related notes... Long post alert. I'm typing this in all black, a black dress and leggings. I've been through too many deaths this year. First my dad's dad, then Barry Chuckle (not as sad, but still sad) and now this. I posted a Work In Progress of Sportacus, Mayor Meanswell, Ms Busybody and an OC; Robbie's big brother Richard, dressed for Robbie's funeral (Sportacus is in a black suit. Will you still recognise him?) with the caption "Why does losing Robbie Rotten feel like losing a family member?" I don't even know this man! I've never even asked him a question online! And yet I don't think I've felt this depressed since watching Jacksepticeye play Doki Doki Literature Club out of curiosity! (I admit, sometimes I can be too curious. Stopped about halfway through Episode 4) In all seriousness, sometimes I wonder if I'll ever feel cheerful and carefree again. I just remember seeing Robbie Rotten on TV. I must say, he is... was... a heroically admirable and darn good actor. There were times when I wondered "How can someone so famous be so pure-hearted?" (I don't want to be proven wrong, to be honest) times where I wanted to give both Stefan and Robbie a hug. Not sure how he found out, but I did when a boy from my Japanese class posted "RIP Stefan Karl Stefansson" or something on our class group chat. A sick sort of spear shot through my heart. At some point, my arms were shaking. To which I replied "What?!" and then 4 GIFS of cartoons crying like there's no tomorrow. I thought it was some kind of joke, I just didn't want it to be true. When I got the news I felt tripped up, and hollowed out. Mum came up to check if I was okay that evening, having heard the news on I'm guessing Facebook, and reckoning I would be sad. She was right. It took me a long time to get to sleep that night. In the space of less than 2 days I think I have experienced 3 stages of grief; Denial, Anger (cancer is a $%*!ing £@?*!) and now probably Depression. Whether you like RWBY, (pronounced ruby) thought it went downhill after Volume 3 or even 2, or have never even heard of it, I feel like drawing attention to my signature. It is a quote from RWBY's creator, Monty Oum, who died in 2015 after reacting badly to a hospital procedure. In ways, I feel like this quote applies to everyone who worked on LazyTown, and motivates me sometimes. I lost my grandad to prostate cancer last winter on my childhood friend's birthday so I think I might know what it feels like. Sad to me, the Chuckle Brothers were a wholesome part of my childhood. This man lead me to meeting my husband, notoriousmdc. Without Stefan, I would have never came here 11 years ago,. I never would have stayed up all night chatting with him in IRC and AIM. I have a lot to be thankful to him for, and without him, my life would have gone a very different course. Not a good one, trust me. Thanks for saying "Happy Birthday" to my dad, even though that was yesterday. At least he's not dead... yet. Rest In Piece our beloved Stefan Karl. We are being tested and tried... We will never forget the great memories you made for us. Yeah, I actually have tears in my eyes right now, I actually cried a little. No joke. Rest in peace, Stefán. You were the Number One Master of Disguise to all of us. May he rest in peace. Stefan Karl was a great guy who loved making people laugh. He was a really caring person, and I'm going to miss him. En ocasiones es muy difícil tratar de expresar con palabras lo que se siente por dentro, especialmente cuando se trata de la temprana partida de alguien que marcó tu vida en alguna medida. Este es el caso de Stefán Karl, quien la vida le fue corta para poder plasmar todo ese inmenso talento que llevaba por dentro pero que sin embargo, con lo poco que nos dejó, nos mostró mucho de su arte, de su alma y de todo ese amor que era capaz de reflejar en lo que hacía. Nos vas a hacer mucha falta Stefán, en especial, en este mundo tan necesitado de gente como tú. Que Dios te bediga Stefán. I can't believe that he's really gone. It's so nice to see everyone gathering to pay tribute and thanks here. On a possibly irrelevant note, Glanni's Girl, that was a sweet reply. Thank you. I'm sorry about your grandad too. Alltaf tekst þér að stela sviðinu. Í þetta sinn með dramatískum hætti eins og þér einum er lagið. Þegar ég fyrst labbaði inn í Latabæ 2006 þekkti ég engan í stúdíóinu og væntingarnar til þess sem ég átti að gera voru óraunhæfar og erfitt að segja nei þegar fullt stúdíó af hæfu fólki á launum beið eftir hoppum og stökkum frá manni. Þú kenndir mér að skemmta, vera stór á sviðinu og standa fastur á mínu. Þú varst hreinskilinn og umhyggjusamur. Það var á sama tíma svakalega gaman og hræðilega stressandi að vera með þér á sviði. Við áttum að fara eftir þaulskipulögðu handriti en það mátti bóka að þú mundir alltaf setja þinn snúning á skemmtunina og trufla mann með fíflagangi. Þvílíka sparkið af adrenalíni sem það var alltaf. Mikið var ég stoltur af sjálfum mér þegar mér tókst að láta þig springa úr hlátri á fjölum Þjóðleikhússins í síðustu Latarbæjarsýningu þinni 2014. Takk fyrir öll samtölin og ráðin sem þú hefur gefið mér í gegnum tíðina. Mínar dýpstu samúðarkveðjur til Steinu og krakkanna"
You always manage to steal the stage. This time dramatically like you alone is the song. When I first went to Latabæ in 2006, I did not know anyone in the studio and the expectations for what I was supposed to do were unrealistic and hard to say no when a full studio of qualified people on salary waited for jumps and jumps from a man. You taught me to entertain, be big on the stage and get stuck on my face. You were upright and caring. At the same time it was gorgeous fun and terribly stressful to be with you in the field. We had to go for a manual script, but it was possible to make sure that you always put your turn on the entertainment and disturb a person with a freaky smile. Such a kick of adrenaline as it always was. I was very proud of myself when I was able to let you burst out of laughter at the numerous National Theater in your last Latvian show 2014. Thank you for all the conversations and advice you've given me over the years. My deepest compassion to Steina and the kids"
I never had the nerve to add Unnur as a friend, so if anyone wants to cut and paste the text of her post here, I'll run it through Google translate, as I'd love to know what she said. So empty and silent feelings I have right now. The first time I started watching the show I saw him not being as a villain or lazy but funny and goofy character he played. I found out about his death on instagram but then I said to myself "Oh, the time has come". At second I couldn't realize that we all lost the most incredible actor of a kids show that he is not with us anymore. Stebbi var engum öðrum likur. Að leika með honum á sviði var eina of að fara í masterclass í spuna. Hann hélt manni stanslaust á tánum og það reyndi á hvern einasta vöðva að halda inn í sér hlátrinum þegar hann gaf manni eitthvað ákveðið augnaráð eða prumpuhljóð. Enn þann dag í dag hitti ég fólk í LA sem spyr hvort ég þekki hinn íslenska Grinch, þvi þau höfðu séd hann hér í Pantages leikhúsinu fyrir mörgun árum og eru enn hlæjandi að honum. Í hefur misst einn dýrmætasta skemmtikraft landsins. Ég er óendanlega þakklát fyrir að hafa kynnst Stebba oh lært frá þessum stórkostlegum meistara. Mínar innilegustu samúðarkveðjur til fjölskyuldu og vina. Elsju Stebbi, hvíldu í fríði og hlátri. Stefán was like no one else. To act with him on stage was like a masterclass in improv. He kept everyone on their toes and it took every muscle to hold in our laughter when he gave someone a certain look or made a fart sound. To this day, I meet people in LA who ask if I know the Icelandic Grinch, because they had seen him here at the Pantages Theatre for many years and are still laughing at his act. We have lost one of the greatest entertainers in the country. I'm infinitely grateful for having known Stefán and for learning from this amazing master. My most sincere thoughts go out to his family and friends. Beloved Stefán, rest in peace and keep laughing. Here is Unnur's message about Stefán. Thank you for making a tribute, it was really sweet. Not much I can add than what's already been said. RIP Stefan. I keep wishing for 2007 again. I got into LazyTown after Stefan's death, and everything I've read about, watched, and heard fills me with bittersweet joy. I'm so happy seeing how he touched so many lives and brought smiles to so many faces, but I'm also sad that I only learned what a wonderful man he was posthumously. 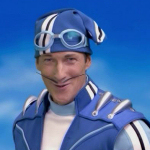 He brought so much charisma and fun to every character he played and breathed life into LazyTown as a whole. When I think of his roles I'll smile at the good memories he left and hang onto new experiences and happiness as I watch the show and try to live by his example. Thank you, Stefan, and may you rest in peace!